(Left to right) Vivian Go, Dr. Bill Miller, Jason Johnson, Magistrate Rebecca Bennett, Ray Lynn Duce, Hanna Piscalko, Elli Schwartz, Christine Schalkoff,Emma Richard. (Back row) Dan Palmer. Yesterday, OSU and UNC students and staff dropped off 28 bags of clothing and toys at the Scioto County Courthouse alongside Dan Palmer of Operation Grace. The bags of donated items were the effort of a collaboration between Palmer, staff from the Attorney General’s Office, the Juvenile Drug Court and Judge Lemons. A compiled list of those in need was given to Dr. Bill Miller, Professor of Epidemiology at Ohio State University (OSU). 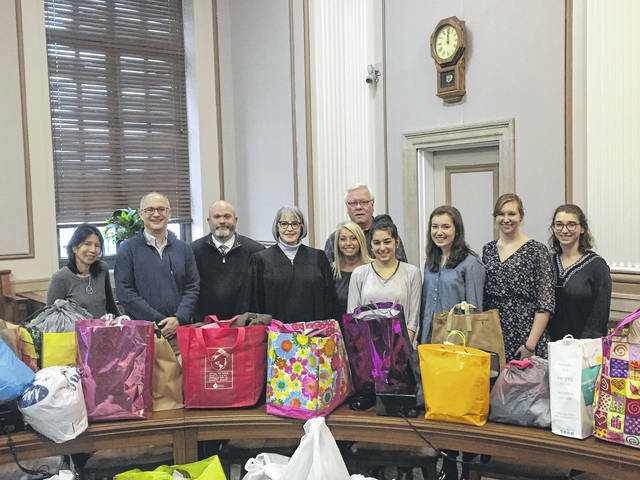 He then collected items from OSU students and staff for the children and participants of the Juvenile Court’s Family Unification and Recovery Program in Scioto County. The 28 bags of items included children’s clothing, toys, undergarments, shoes, socks, coats, jackets, gloves, hats along with other items for babies, children and a few adults. The bags were delivered by Dr. Miller, his students and a colleague on Friday morning. Dan Palmer of Operation Grace was overjoyed with the support provided by Dr. Miller and the OSU College of Public Health. “I can’t say how appreciative we are of this. This will positively impact so many lives. Someone taking a vital part in assisting these kids (and that) someone being outside our community, it impresses me,” Palmer said. “This is great. I think this will really mean a lot to them,” Magistrate Rebecca Bennett said. According to Dr. Miller, he felt compelled to bring assistance to Scioto County after working closely with the opioid crisis all around the world. “My background is as an infectious disease physician and epidemiologist. I began working with opioid related things globally, probably fifteen years ago. I’ve done work all around the work in places like Vietnam, Indonesia, Ukraine. Other than as a physician in the 80’s I haven’t done dealt with many opioid related issues domestically. So when this research opportunity came about, it’s an issue that’s hard to ignore. We wrote the grant and were fortunate enough to get it, it’s a very community oriented project where we’re trying to work with the community to identify and service needs and this was just an obvious thing when it was brought to my attention that we could do to help,” said Dr. Miller. “One of the best things of being at OSU is the students are tremendous, brought this to their attention and the Public Health Leadership Council decided to take on this project with the help of the whole college, and the rest is history,” Miller said. Vivian Go, Professor at University of North Carolina, worked closely with Miller on the grant and came along with two of her students to witness the product of the group’s efforts. According to Miller, it was the help and determination by students, like Elli Schwartz, that made the donation a success. “Dr. Miller approached me with this project since he’s been doing research in the area, seeing that it could really benefit the children and some of the adults impacted by the opioid crisis. He sent me the list of names and items needed and I really just had to send it out to students, faculty and alumni of the college and people were really quick to sign up and pass it along to their friends. It really was something that a lot of people at OSU wanted to do to help the area,” OSU Undergraduate, Elli Schwartz said. According to Palmer, is it possible that this donation will become an annual effort from OSU.